This coconut lime chicken is for everyone out there who gets unbelievably bored eating plain old chicken day in and day out but can’t be bothered with making anything too fancy for dinner. I’ve said it before and (to be honest I can be a broken record at times) I’ll say it again: while I’ve never been the biggest fan of chicken Mike can’t get enough of it. He’s all about the white meat while I couldn’t care less. So naturally that means I have to constantly try to come up with new ways to dress it up and make it something really worth eating. That being said I’m still happily noshing away on this honey mustard chicken salad – bacon, avocado, mustard….just load me up. While I could wax on about how much I love that salad today it’s all about this coconut lime chicken, and I promise it’s just as good! Altogether this dish is super easy to make – you only need one large skillet and about 30 minutes to make! To prep the chicken simply place the breasts between two pieces of plastic cling wrap and pound them down to make them even in thickness. If you own a meat mallet then go ahead and pull that out. I personally just use my rolling pin to bash the meat down and I find it works just as well. This will help flatten the chicken so that is cooks evenly and make for more tender chicken. Once flattened just sprinkle each side of the chicken with salt and pepper and move on to browning the breasts. All you need to do is melt a little coconut oil in your skillet and cook the chicken on each side for about 5-7 minutes until a brown crust forms. At this point you don’t need to worry about cooking the chicken all the way through because you will add them back to the pan later to soak in more sauce/cook through. Until then – remove from the pan and set aside on a plate while you make the sauce. Once you’ve removed the chicken, give the pan a little wipe down with a paper towel to remove and brown/black bits. Melt a little more oil then continue on to sauté your onion. Cook for a few minutes to soften then add the pepper. After a few more minutes add the chicken stock, cilantro, lime juice and chili flakes to your pan. Bring the mixture to a slight boil and then let simmer for a few minutes. Finally, add the coconut milk and continue to let the mixture simmer. It will cook down and thicken slightly. After a little more simmering, add the chicken back to the pan and let cook through fully as it soaks up more sauce and that’s it! Serve the over a bowl of rice or cauliflower rice (for paleo/low carb) to soak up all the extra sauce and enjoy. Whole30: If you need this recipe to strict Whole 30 make sure to check the labels on your chicken stock for hidden sugars. A few people have had issues with the sauce thickening – this could come down to what type of coconut milk you used. Not all coconut milks are the same and some come out thicker/thinner than others. Aim to use a thicker, full fat coconut milk from a can. You can use just coconut cream as well if you have it on hand. If your sauce doesn’t thicken the way you want it to you can add the starch and water mixture to do the trick for you. While the sauce should reduce down and get thicker as your simmer it, it’s not supposed to be really thick like gravy so keep that in mind as you cook. This chicken is admittedly not the prettiest looking dish as some of you have commented on. Add a pinch of turmeric powder to the sauce to give it a nice golden colour but keep in mind it will change the flavour. Also remember to wipe down the pan after browning the chicken to remove any leftover brown/black bits. That will go a long way in affecting the final colour. 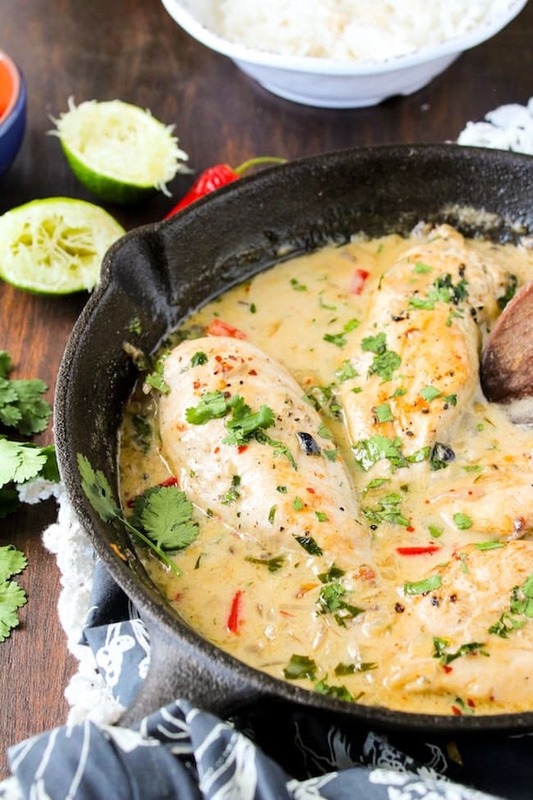 Don’t forget to #asaucykitchen on instagram if you try this coconut lime chicken! We love seeing what you make! You can also post your pictures to my facebook page! Melt the coconut oil in a large skillet over a medium high heat on the stove. Add the chicken breasts and cook each side for 5-7 minutes or until browned on each side. Remove the chicken from a skillet and set aside on a plate. The chicken doesn't need to be fully cooked yet because you'll be returning it to the heat shortly. Wipe down the pan with a paper towel to remove black/brown bits. Add a little more oil back to the pan along with the chopped onion to the same skillet and sauté for a few minutes to soften. Add the chili pepper if you're using it. Sauté another couple of minutes. Add the chicken stock, lime juice, cilantro and chili flakes. Bring the mixture to a boil and then reduce down to a simmer. Let simmer for about 5 minutes to let reduce down. Add the coconut milk (and the turmeric if using) and bring to simmer again for another 5 minutes. Add the starch and water at this time if you're using it. You may need to raise the heat slightly higher to bring this to a boil to activate the starch. Once the sauce thickens reduce it back down to a simmer. Press the sauté button on the instant pot and wait for it to heat up. Add the coconut oil. When the oil is simmering add the red onions and pepper. Cook for about 3 minutes to soften. Add the chicken stock, lime juice, red pepper flakes, coconut milk and turmeric. Taste the sauce and season with salt and pepper. Stir and let simmer for a minute or so. Add the chicken breasts. Secure the lid on the instant pot and make sure the dial on top is set to 'sealing'. Cook on high pressure for 8 minutes. (Press 'Manual' or 'Pressure Cook' to set the timer.) After the time is up the Instant Pot will automatically switch the keep warm. Let it keep warm for 10 depressurising on it's own before releasing the steam valve. After removing the lid carefully remove the chicken breasts from the soup and transfer to a cutting board or a plate. Cut the chicken up into small pieces. With the lid off and the chicken out press the 'Sauté' button again. Bring the sauce to a boil and add your starchy water to thicken. Once it begins to thicken turn off the heat and add the chicken back to the pot along with the chopped cilantro. Taste the sauce again to season with addition salt/pepper/ lime juice if need and enjoy! If you need this recipe to strict Whole 30 make sure to check the labels on your chicken stock for hidden sugars. A few people have had issues with the sauce thickening - this could come down to what type of coconut milk you used. Not all coconut milks are the same and some come out thicker/thinner than others. Aim to use a thicker, full fat coconut milk from a can. You can use just coconut cream as well if you have it on hand. If your sauce doesn't thicken the way you want it to you can add the starch and water mixture to do the trick for you. While the sauce should reduce down and get thicker as your simmer it, it's not supposed to be really thick like gravy so keep that in mind as you cook. This chicken is admittedly not the prettiest looking dish as some of you have comment. Add a pinch of turmeric powder to the sauce to give it a nice golden colour but keep in mind it will change the flavour. I have now made this a few times…SO GOOD! I made it exactly how the recipe says the first time, the only change I’ve made every other time is doubling the sauce. It’s so good need as much as possible! I serve with rice or cauliflower rice and carrots. It’s even good on top of carrots!! Thank you for the recipe. I have sent this to all my gluten free friends telling them it’s a must make! Hi Alyssa – I love that! SO glad you enjoy it so much and thanks for sharing it with your friends! I make this at least once a week – delicious, easy, and everybody loves it! Thanks Erin! Glad you like it! I’d like to make this dish for a dinner party with 12 people. I’d like to make it either in the oven or slow cooker so that I don’t have to do any active cooking when the guests arrive. Any suggestions? Soooooo good and easy to create. Thanks for sharing this yummy recipe Sarah! Absolutely delicious! Thank you for the recipe. I just left out the red chilli and the turmeric, otherwise I followed it exactly. Thanks Eve! Glad you liked it! Hi! I don’t like spicy food – what should I sub for the pepper? Would a bell pepper work best, or mild green chilies from a can? Thank you! Hi Christie! Bell pepper would be a great sub but you can also just leave it out altogether if you like! Made this last night. Certainly an easy recipe to put together. However, it did seem to be missing something. Not sure what that something is. Lemongrass? Chinese Five Spice? Try adding kefir lime leaves…will give it that authentic taste! Thank you so much Lisa! That makes me so happy to hear how much you’ve enjoyed/shared it! I have to say I kind of threw this together in my Instant Pot, I tossed in some mushrooms too. I didn’t even see the instant pot directions and it still came out great! I do cook my chicken breasts for 35 minutes, though. I prefer shredded chicken because I can’t stand to eat any other form of chicken reheated. I didn’t pound or precook the chicken. I didn’t have peppers so used some cayenne after it cooked, along with salt–seasoned to taste. I didn’t have fresh cilantro but had some frozen with olive oil and tossed that in. Didn’t have arrowroot, used tapioca flour. I mean I literally threw everything in my instant pot with 3 large Costco Organic Chicken Breasts–2 were frozen and 1 was thawed. I just don’t have time to do that much prep work. It was delicious! I love my Instant Pot and this recipe is a keeper–very forgiving! Thank you! That’s super helpful Tracy – thanks so much for sharing what you did! So glad you enjoyed it! Haha I know what you mean! Thanks Katelyn! This is now one of our go-to recipes! All of my kids (ages 6, 4, and 1) love it too! I prefer using chicken thighs for flavor and texture, but if I don’t have time to cut off the fat, I’ll stick with chicken breasts and it’s still delicious. I really love the turmeric as well. Everyone I’ve made this for has also enjoyed it. Thanks for sharing! That’s so great – so glad you all enjoy it! Thanks Nicole! Hi Desirae! I recommend using coconut milk from a can here because it’s got a much thicker consistency that makes for a silkier sauce. Coconut milk from a carton is just a bit too watery to get the right texture here. I made this tonight and had to switch the red onion for a brown onion and lime juice for lemon juice because I was short of these ingredients and it was delicious! I will definitely be using your website again! Yay! So glad to hear it! Thanks for coming back to let me know what you thought! Absolutely delicious! My family loved this. I didn’t have a red chili so I used about 1 T. of gochujang paste – I would definitely do that again! Oooh I love that idea! thanks Katie! Curious, is there the possibility of a crock pot version? I really liked this dish…but the turmeric completely changes the flavor and really takes it over. I should have been able to guess that…I included it only because it’s so good for you. It didn’t taste like lime or cilantro to me at all. So…for anyone out there wondering if they should add the turmeric, I’d recommend against it! 🙂 But still try the recipe!! It’s great! Hi Cara! So glad you liked it! I totally get what you mean about the turmeric – I’ll make sure to make that more clear in the notes. Thanks so much for coming back to let me know what you thought! I generally add a pinch of tumeric (because it’s good for you) being mindful of it TAKING OVER the dish. I sub in a touch of curry to add flavor. Absolutely delicious recipe! I used chicken thighs and added mushrooms and baked it all in the oven at 200C for 40 minutes. Served on top of a kale, rocket, spinach & cashew salad. My husband loves good food and was totally impressed with this recipe, I had to hide the left overs! This will definitely become one of my go-to recipes, thank you heaps!! That’s so funny! So glad you guys enjoyed it – thank you so much for coming back to let me know what you thought! I made this tonight and I am so glad that I did! I was searching Pinterest for something healthy and one dish when this one caught my eye. I doubled it for my family of 6, subbed ghee for half the amount of coconut oil called for, left out the whole red chilli, used one and a half chopped leeks instead of the red onion (didn’t have it), halved the amount of crushed red chilli flakes, and used the turmeric and arrowroot starch. Served it over cauliflower rice and it was a hit! Since it was mild I even blended the left overs to feed our 10 month old – he loved it! I will definitely make this again. Thanks so much for posting! I’m so happy to hear that! Thanks so much for coming back to let me know what you guys thought 🙂 I also really appreciate you sharing the adaptions you made too – those are always so helpful to see! Thanks Sonya! I just came across this recipe and had to try it out! So delicious! I used a whole can of coconut cream rather than the measurements to try to thin out the spices for my picky kids, and just let it simmer a few extra minutes. So good! Thank you for the recipe, definitely going to be a regular for me now! Thanks Courtney! So glad you liked it! Finally got around to trying this – SO GOOD!!! I added Thai basil cause I had some and wanted to try it and extra cilantro (cause I love cilantro). Served over cauli rice for me and regular for the BF cause he still has a metabolism. 😂 Thanks for a great recipe!!! Extra cilantro is always a good idea in my opinion! So glad you liked it! Thanks Melissa! Made this last night and it was a hit for hubby and I! Omitted the tumeric powder and cilantro but added some shredded coconut – and it tasted so delicious. Served it with basmati rice. Yum! That’s so great! Thanks so much for coming back to let me know what you thought Lauren! One question on the instant pot directions regarding the chicken. Do you pound it thin and saute it first like the stove top directions or do you throw it in raw? Instant pot directions only say to saute the onion and pepper, then add all of the sauce ingredients and then the chicken. Thanks! Nope! Just saute the veg and then pop the chicken in raw and go from there. Hope you like it! I never comment but I have to say, this recipe is AMAZING!!! I have made it probably a dozen times and every time my family raves about it. And it is so easy. I have also suggested it to friends and family, who all loved it. Would love more simple, delicious recipes! Keep up the good work! That makes me SO happy – thank you so much for coming back to let me know what you thought! Hello! This is my favorite go to recipe! Have you or anyone else made a bunch and frozen it? Was thinking of making individual lunches ahead of time for easy grab and go to work. Wanted to know how it freezes and thaws! Thankful for this amazing recipe!!! Hi Amanda! I’m so glad you liked it – thanks so much for coming back to let me know what you thought! I haven’t tried freezing this yet but I’ve frozen similar dishes and I just freeze it and then defrost in the fridge. Does the coconut cream separate if you freeze it? Would love a recipe like this to freeze. Hi Theresa! I haven’t personally made this in the crock pot but I have seen many people tag me on instagram who have. The method is probably similar to how I make it in the instant pot (instructions are included above) but with a longer time – chicken breasts normally takes about 3-4 hours on low to cook. Hope that helps! I’ve made this twice. It’s so good. For a change the second time, I added ginger, curry, and cayenne for a Thai flair. It was great both ways! Those sounds like very tasty additions! Thanks so much for coming back to let me know what you thought! I can’t wait to make this dish tonight. Can I substitute the chicken breast with chicken thighs and legs? Wish I had found this recipe sooner! Ooh I love the sound of lime oil – might need to get my hands on some of that! So glad you liked it – thanks for coming back to let me know what you thought! Made this recipe for dinner tonight & the whole family loved it, including the little ones. Right mix of spicy & tangy for us. Served it with white rice & veggies. Thanks Claudia – really glad you all enjoyed it! Loved this! This will be on repeat at our house! Got my to play around with adding veggies! Thanks! I do not like cilantro at all—–can I replace it with something or just leave it out?? thank you so much and thanks for IP conversion!! That’s no problem – just leave it out! I don’t usually comment on recipes but this is one of my favorite dinner recipes and definitely my all time favorite whole30 dinner! So glad you like it! Thanks so much for coming back to let me know what you think! So…is it 5 mins or 8 mins? I have not used my instant pot yet – trying it out with this recipe – and I am wondering if there is something I don’t know about timing with the IP or if this is a typo. Hi, I’m a newby to your site and I’m glad you sorted it out between the 5-8 minutes as I’m intending to get an Insant Pot and I’d hate to blow anything up onto my ceiling like my daughter-in-law did with my pressure cooker. I’m hoping to find more “Low Carb” and Whole30 recipes, so if you have ore in your pocket, please share. Love your site. Oh no that must have been so scary with your daughter-in-laws instant pot! My mother-in-law is pretty wary of mine for that reason but fortunately we’ve never actually had any issues. Thanks for stopping by! I will be working on making more Whole30 instant pot recipes soon! Is the coconut milk supposed to be unsweetened? Will it make a difference if it is? Once again, coconut milk proves itself to be a revelation. This was a tasty recipe that I actually had all the ingredients for in my fridge. As per another commenter’s suggestion, I added garlic and some veggies and found it quite delicious. Thanks! Thanks Tammy! Coconut milk is a daily lifesaver in my kitchen 😀 Thanks so much for coming back to let me know what you thought! I just made this today. After reading the comments, I decided to add one serrano pepper, 2 cloves of garlic, and about 1 tsp of grated fresh ginger. I used an immersion blender to finely blend the sauce. It was delicious! I served it over cauliflower rice. Thanks for another delicious recipe to add to my Paleo collection. Can’t go wrong with any of those additions! So glad you liked it! ! I made this for my daughter last month when she got home from school for the summer. She loved it so much, I’ve had to make it weekly. Thanks again for a great recipe! I love that! Thanks so much for coming back to let me know what you both thought! Sadly this recipe did not work out for us. The sauce turned out like a brown gravy, not creamy and delicious looking like the picture. It also didn’t taste like coconut lime. I could catch some like, but no coconut. The red pepper flakes over powered. I want to try again because your picture looks so dang delicious. My hubs and I have come up with a few tweaks to try. Hi Katie! Sorry to hear you guys weren’t crazy about it – hope you like it more after tweaking it to your liking! This is now one of my go to recipes. This is delicious. Everyone I’ve made it for raves about it. I have a question, does anyone have a conversion for cooking it in the instant pot? If so how do you do it? Hey Amanda! Just letting you know that they instant pot instructions are now up if you still want them! I know this is prob a silly question, but i want to know how i could double this for 6 people instead of 4? Hi Maddison! Not stupid at all! I actually did this recently too – I ended up using 6 large chicken breasts and then just doubling the amounts of everything else. If you’re not crazy about too much spice stick to one chili pepper though. The extra sauce worked out well poured over rice/cauliflower rice. It might take a little longer for the sauce to reduce down and thick up so keep that in mind when making it. Hope that helps! Do you think I would be able to make the sauce before and and freeze it for later? I don’t ever comment on these type of things but just made this for dinner. It was amazing!! Very well received by my hubby, I was pretty chuffed with it too. Thank you! I’ve just printed it for my recipe book. A definite keeper. Thanks so much for coming back to let me know what you guys thought – so happy you both enjoyed it! I made this recipe using my Instant Pot. I added ginger and sliced mushrooms. It was a HUGE hit! Ooh – love that you did it in the instant pot! So glad you liked it – thanks for coming back to let me know! Please share details for instant pot!! Thx! Hey Lori! Just letting you know that they instant pot instructions are now up if you still want them! How did you convert it to IP? Can you tell how you did it in the IP?? Hey Sarah! Just letting you know that they instant pot instructions are now up if you still want them! Amazing recipe! I think people who may have struggled with it just don’t have a knack for improv cooking. I played with it, kind of eye balling the ingredients and adding in jalapeños to add some spice. Also used coconut cream and loved the thickness it added. Really yummy, definitely in the rotation of house favorites! I added Ginger, garlic and kaffir lime leaves and the flavour was amazing! This is such a nice recipe. LOVE the sound of those addition! Trying those out next time i make this! Thanks Ali! Excellent! Will be making this again soon! Thanks, Sam! Glad you enjoyed it! I’m sad that I didn’t share the same enthusiasm others did about this recipe. We felt it didn’t quite have enough flavor. We followed the recipe exactly but we just felt it was missing something. I will try it again as a solid base, but we will play around with adding some additional spices! I understand! Hopefully by making it your own and adding your own flair will make you love it more next time! We found it to be quite bland. I was hoping for a more coconut -y flavor. It was nicely creamy. Sorry to hear you weren’t too crazy about it! I tried your recipe with tilapia and it was ahhhmazing! I’m looking for recipes to help me be more creative while on Whole30 program and this is one of my favorites.Thank you for the recipe. Thanks, Karen! So glad you like it – good luck on the rest of your Whole30! I wish I could give this recipe 10 stars!!!! Incredible flavor in under 30 minutes with a total of 4 items to clean (pot, spoon, cutting board and knife). The entire family (5-37 yr odl) loved it- should have doubled. Definitely added to our weekly meal list. THANK YOU!! That is so wonderful – thank you so much for sharing that! I’m so glad you guys enjoyed it 🙂 Thanks for coming back to leave a comment/review! Made this dish tonight…was really nice. Not to ‘heavy’ but still had great flavour. I had doubled the amount of chicken and doubled everything else, plus a little extra. Didn’t put any fresh chilli in it as kids were eating, but 2 chillies would of made it the bomb. I also added a tablespoon of fish sauce. Hey Leighton! Thanks so much for coming back to let me know how you it went – so glad you guys liked it! Just tried to make your recipe. I should not cook when I’m tired however I totally messed it up but it still was delicious. I used a whole can of coconut milk and forgot the chicken broth so no need to use a thickener. I added a carrot, red bell pepper, cauliflower (because I did not feel like making a side dish of veggies) and lemon grass. Added some Thai basil on top for garnish and served it with rice. I did not mean to make so many changes but at least it turned out amazing. Thank you for the inspiration. Awesome! So glad you liked it- thanks Alva! Made this tonight and my husband and I loved this. Added some cornstarch to thicken the sauce but overall, this was so. good. I served mine with roasted garlic broccoli and cilantro lime white rice. I put tbe extra sauce over both the sides and it was amazing. Thanks for the great recipe! Will make again for sure. Thats awesome – so glad you guys liked it! Thanks so much for coming back to let me know how it went! This was sooooo good. I saw a few comments somewhere about doubling the sauce so I did-that way I had plenty to drown my cauliflower rice!! I’m currently in a round of Whole30, and always looking for different things, I would make this anytime though!! Ooh congrats on your Whole30! I’m always in awe of anyone who can complete it 😀 SO happy you liked it! Thanks for coming back to let me know how it went! Omg this was so good! I followed the recipe exactly but left out the pepper because we don’t like spicy food (still put in the red chili flakes for a tiny kick!). Thank you for the recipe! 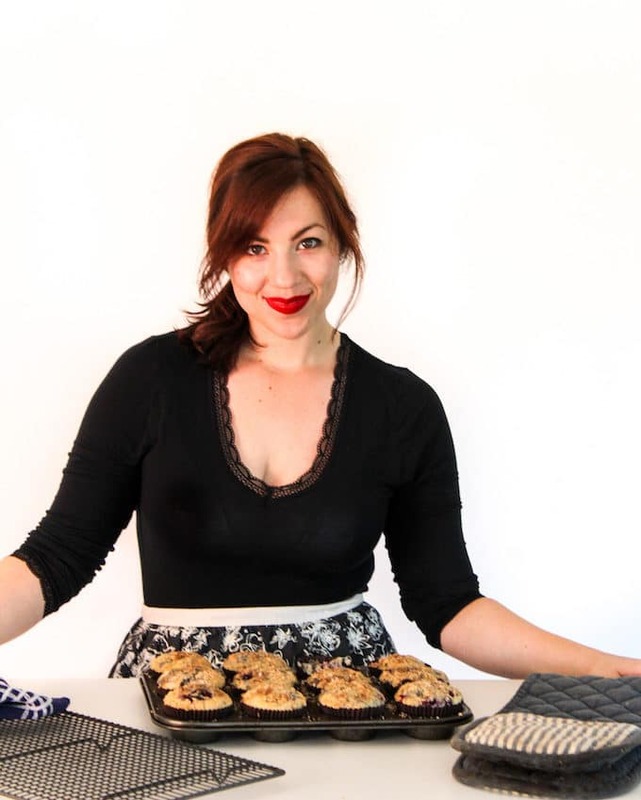 This is the first I’ve been on your site and I’m about to scour for more yummy recipes! This recipe was fabulous! I’ve had it pinned for ages and finally decided to make it today. I served it with mashed parsnips and cauliflower rice, and the “gravy” was delicious on both veggies . An awesome whole 30 recipe!!! That’s fantastic! So glad you liked it & your sides sound amazing! Thanks so much for coming back to leave a comment/ review! Had tonight for supper so good nice creamy flavor,added red peppers extra lime zest, lemon grass really nice. That sounds delicious – thanks Sue! And thanks for sharing your crockpot adjustments. That’s super helpful! Sounds amazing. Do you think it will be creamy enough with lite coconut milk? I have an opened can leftover in the fridge. Thanks! Hi Kelly! It won’t be quite as creamy, but it will still work! Thanks Jenn! Added lemon grass & basil sounds lovely! Gonna try that! Hi, can I replace the starch with flour to thicken the sauce? Finally made this last night and it was AMAZING! It’s been on my list for months. Our dinner plans changed last minute and was able to whip this up quickly because I had all the simple ingredients on hand. And my 4 year old raved about it!! I’m just sad I didn’t take a pic to post on my Insta and that there were no leftovers. This will definitely find a spot in our rotation. Thanks for this super yummy and simple recipe! Yay! That’s awesome – I especially love it when the little ones approve 🙂 So glad you guys enjoyed it – thanks for coming back to let me know how it went! I MADE THIS LAST NIGHT AND ALTHOUGH IT WAS GOOD, IT SEEMED A BIT BLAND. i ADDED TWO TABLESPOONS OF FISH SAUCE AND IT GAVE JUST THE RIGHT AMOUNT OF PEP. Ooh fish sauce would be lovely in this! Gonna have to try that next time I make it! Hi there! Have you ever tried cooking this with shrimp instead of chicken? Just made this tonight. Where has this recipe been all my life???? Very yummy!! Calories at 317 per serving include rice? Our attempt wasn’t quite what I thought it would be, last night, but this is my first time making chicken with a pan sauce, paleo-style, and I’m definitely sure there’s a learning curve, there! Waste not, want not, however, so, for leftovers, I’ll be shredding the chicken and serving it more as a soup (I doubled the sauce). Maybe better on Day 2? Thanks so much for the recipe- I look forward to trying more! Hi Hannah! Sorry to hear that it didn’t live up to expectations! Was there anything in particular you were crazy about or didn’t come out right that I can help you sort out? Hope you enjoy it more today! Hi there! I stumbled upon this recipe on Pinterest, showed it to my husband, and he is begging me to make it for him as soon as possible. Based on the comments here, it sounds like we are in for a treat! Quick question though, I prefer chicken breasts but my husband prefers chicken thighs. Would the cooking need to be adjusted at all to make this with thighs or a mix of breasts and thighs? I’ve had this about 5 times now. Love it. I use about 8 dried birds eye chillis chopped up. Gives it a lovely kick and really compliments the lime. I also cut up the chicken to bite size pieces. One of my favourite quick meals. That’s great! Love the addition of the bird’s eye – totally trying that the next time I make this! Do you still brown the bite size chicken in the beginning of the recipe? If so, for how long? Made this dish again and used some asian crackers to complement, this dish goes from strength to strength. Your lime chicken dish is fantastic and takes No. spot on my list for chicken dishes. Well done and thankyou. We made this and loved it! It was so delicious and easy to prepare! Thanks for sharing! I dumped everything and a little more into the crockpot for 3 hours then removed the chickn and reduced the sauce. Yum!!! Well Sarah here goes. I was going to make an Indian Yellow curry tonight but your recipe looks great. Will keep you posted. I made this tonight for dinner. Its a winner. So delicious! I cut back on the red pepper chili and red pepper flakes. YUMMO! Fighting over leftovers is probably the most flattering review I could hope to get! Thanks for coming back to share – so glad you guys liked it! Holy yum! I made this last night and it turned out perfectly! SOOOO good! I used tapioca flour in place of the root starch which turned out great. I also put in a red bell pepper instead of a chili pepper since my little guy was eating with us. The only thing wrong with this meal had nothing to do with your awesome recipe–but cheap chicken. Anyway, I encourage all to make this recipe! Easy and delicious! I can’t wait to eat leftover tonight and make this again! So yummy!! I used an entire can of coconut milk (because I love it so much) and only a splash of broth to deglaze the pan after sautéing the onions. Also, I used gluten free oat flour to thicken the sauce. I never leave comments but I just had to for this recipe. I’ve also shared the link with a few friends. Thanks for such an easy and delicious recipe. This will be making its way into my “Weekly Meal Plan” Pinterest board! Since the amounts vary slightly depending on how much your reduce the sauce down while cooking I don’t give an exact measurement per serving size. I just didn’t feel like I could give an accurate answer there. It’s just 1 piece of chicken & about 1/4th the amount of sauce. Hope that helps! I don’t understand how you used the same pan for both parts of the recipe and your sauce still came out a creamy color? Mine turned brown and I would expect it to after sautéing the chicken in it. Do you clean your pan in between? If not, any thoughts on what I could do different? Hi Kristina! I think one factor may be the type of pan – when I made this for my parents using their non stick skillet it had a slightly different colour. If yours is turning out too brown for your liking that I think wiping it down in between the chicken and making the broth would be a good idea! That way you’re at least starting out with a fresh slate. Hope that helps! So sorry you didn’t like it! Are there any specific questions you have about the recipe that I can try to help out with? Loved the flavors in this! I added some Trader Joe’s frozen green beans when I put the chicken back in the pan to bump up the veggies. It all came together very quickly for a great weeknight meal with lunch leftovers! SO glad you liked it! Thanks for coming back to leave a review/rating! As there is just me and the wife at home now could we make this and freeze half for later or does it not freeze well? I’ve never tried freezing it myself so I can’t say for sure how it would come out, but I think you’d be fine doing that! I use a lot of recipes off line, but for some reason I don’t usually leave comments. This time though, I absolutely had to! This sauce was the most amazing thing I’ve had in a very long time!!!! It has a great balance between the lime and the coconut! I’m in love!! Thank you so much!! That makes me so happy to hear! Thanks for coming back to leave a comment – it means a lot! Mine tasted good when I made this tonight but it didn not look like your picture. It thickened up more and there isn’t as much sauce. I wonder what I did wrong. Maybe next time I need to add more chicken stock? Hi Candyce! I’m so glad you enjoyed it! Like you said in the other comment – I think it might have simmer for too long by the sound of it. Stove top temperatures can vary and yours might run at a consistently high temperature than mine which could result in your sauce evaporating more than it should. Next time I recommend cooking for less time, or adding a bit more chicken stock like you said. I’m glad you still enjoyed it though! Thanks for coming back to leave a comment/review! Let me know if you’ve got more questions and I’ll try to help you out! I’m going to try this tonight! Something to note about arrowroot starch is that it thickens when it isn’t too hot. If it is too hot it doesn’t do anything until it cools back down, so it’s hard to gauge if you have enough if you don’t like to measure. I’ll often use tapioca starch or cassava flour if I care that much. This is going to be awesome! Ooh thanks for that tip about arrowroot – I didn’t realise! Hope you like this as much as we do! First time making this dish. Very yummy and the best part my husband didn’t even know it was Whole 30!!! Ha! I love when that happens! So glad you liked it and thanks for coming back to leave a comment/rating! This is my 2nd time that i followed your recipe. I absolutely love it! it comes a good combination flavors: Lime + Cilantro.Everything is so delicious! Hi Sarah! I’m getting ready to start Whole 30 tomorrow and I can’t wait to try this recipe! Thanks Nova! I hope you enjoy it! Super good, thank you! I added 1 tsp curry powder and 1/4 tsp cumin. The mix of flavors was great. I also shredded the chicken. Delicious! Yay! Glad you liked it! Love the added curry powder too! Absolutely loved this! I made it for me and a friend and it was fantastic. I added a little too much red pepper flake (which turned out to be great) and cooked the chicken in a little white cooking wine. The only thing I’d do you have any suggestions for veggies to add to the dish? I’m a sucker for just packing everything full of veggies. So glad you liked it! I love that you also added white wine to it-that sounds fantastic! Usually whenever i want to up the veggies I just throw in whatever I have in while the sauce is cooking or steam something like broccoli at the same time. I think set peppers go well in this and I can always pack in a ton of spinach pretty easily. Hope that helps! I added frozen peas, bamboo shoots, and garlic since we like those a lot in Thai style dishes. Was a hit. Hi I have made this dish with a little bit of curry powder and slivered red/orange/ yellow peppers as well as a can of chickpeas over rice. My family loved it! Ooh I love all those additions! Chickpeas would be a really great way to bulk this out! Thanks for coming back to leave a comment! The flavor turned out amazing, but mine isn’t nearly as thick as your photos! I don’t know what I did wrong! It was more like a watery soup. Hi Alicia! Did you add any type of starch to thicken the sauce? I think different coconut milk brands can make a difference as far as thickness goes. I never need to use starch myself, but based on the feedback I’ve received for this recipe it can go either way. If you did add starch and it still didn’t thicken, was the broth simmering/boiling when you added it? If it wasn’t that may have been why it didn’t thicken. Other than that it may have just needed to cook for a little longer. The longer it cooks, the more it will reduce down which should thicken the sauce. Hope that helps! Recipe says corn starch. Is that really OK on WHole 30???? Hi Eliz! I say in the recipe to use arrowroot for a paleo version and then list corn starch as well. I list corn starch because it’s a much more accessible ingredient to most people. That and a lot of people aren’t necessarily wanting a Whole30 recipe – just something easy to make for dinner. I’ll try to make that more clear in the recipe though incase isn’t not clear enough. Thanks for pointing that out to me! This dish was a hit. My husband can’t eat too spicy but I like a litle kick so I added a small can of chopped green chilies. I also roasted a can of baby arichockes and added them at the end. I used tapioca starch because I had it and it thickened beautifully. I was barely halfway through my serving and my sons plate was clean, I mean clean! Husband only needed to add a little bit of sour cream, such a wimp :). Made riced califlower to absorb the goodness. A definite keeper. Oh, to cut down on prep time it’s nice when your partner volunteers to be sous-chef. Cleans plates are my goal! I love all your additions – they’re making me hungry now 😀 So glad you guys enjoyed it! I am not sure exactly what I typed in my search engine or what page I linked from to come across your site, but am I ever glad I landed here. This recipe is delicious! So simple and easy to make. My husband and I were fighting over the leftovers the next day – I can’t wait to try out some more of your recipes! Thanks for sharing them. When people begin fighting over leftovers I feel like I’ve done a job well done 🙂 So glad to hear you guys liked it! Thanks for coming back to leave a comment! I found this tonight and made it for my family and it was SO GOOD! For sooooooooome reason, I started this at 3PM and when I finally finished and looked up at clock it was 6PM! I have absolutely NO IDEA why in the world it took me THREE HOURS to make, but it turned out wonderfully regardless! I had to double this recipe since I have 6 people to feed, and I thought I’d run into problems once I realized I wasn’t supposed to premix the chicken broth and coconut milk, but even that turned out fine once I added enough corn starch to thicken it (we Texans like our gravy, so it was very thick!). 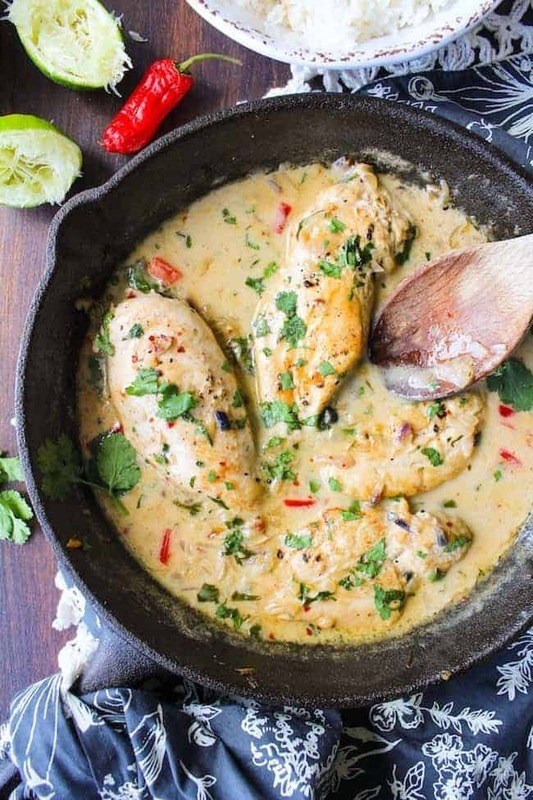 My grandmother makes a version kind of like this but lemon chicken with no coconut milk, so it was hard to make my taste buds accept that it was SUPPOSED to taste differently lol. So glad that you liked it! Your grandmother’s lemon chicken sounds delicious too btw! That means so much to hear! So happy that you enjoyed it! I like the way you think with the bacon! Glad you liked it! Can I use rice noodles instead of rice? Do you think this will work if I double the recipe and use 6 pieces of chicken? I want sauce to put over rice too and I need to feed more than 4. Just wondering how much sauce it really makes. I never usually come back to a blog to comment on a recipe – in fact, this might be the first time, but I made this recipe tonight and it is absolutely DELICIOUS. I can’t wait to make it for friends and family. I was sipping the coconut sauce like soup! My husband loved it too. We’re traveling in Thailand now and happened to have all of the ingredients for this dish at our place in our tiny little kitchen, which was another bonus. Thanks so much for this recipe! I feel very honored! Thanks for coming back to leave a comment – they make my day! I haven’t made this yet, I’m planning to try it tomorrow but I wanted to thank you for having such detailed instructions. I didn’t grow up cooking so it’s nice to have an explanation like flattening the chicken. Based on the reviews, I’m sure I’ll love it. Thank you so much for saying that! I try to always remember (although I’m sometimes bad at it) to spell out instructions clearly. I’ve found myself stuck in the middle of far too many recipes before when I’m not sure what it is exactly that I’m supposed to do. I hope you love this as much as we did! Excellent… Seriously awesome. I realized that the package of chicken breasts I had on hand was pretty small, so I diced them up after browning and added fresh green beans that I had pre-boiled to the skillet along with the chicken for the last part of the cooking time. I couldn’t find coconut cream at Whole Foods, but I had read on another site to buy a can of full-fat coconut milk and refrigerate for a few hours prior to cooking. The cream rises to the top and that’s what I used…. No need for me to add the arrowroot/water mixture. Sauce was a perfect consistency! Thank you so much for sharing such a great recipe. Me and my family thank you! Yay! So happy that you guys liked it! I haven’t tried this yet but it looks delicious! I’m hesitant to use the full fat version of the coconut milk, Is there a low fat alternative without effecting the flavor and consistency? I used full fat here for the consistency, but if you want to use a light milk substitute that shouldn’t be a problem. 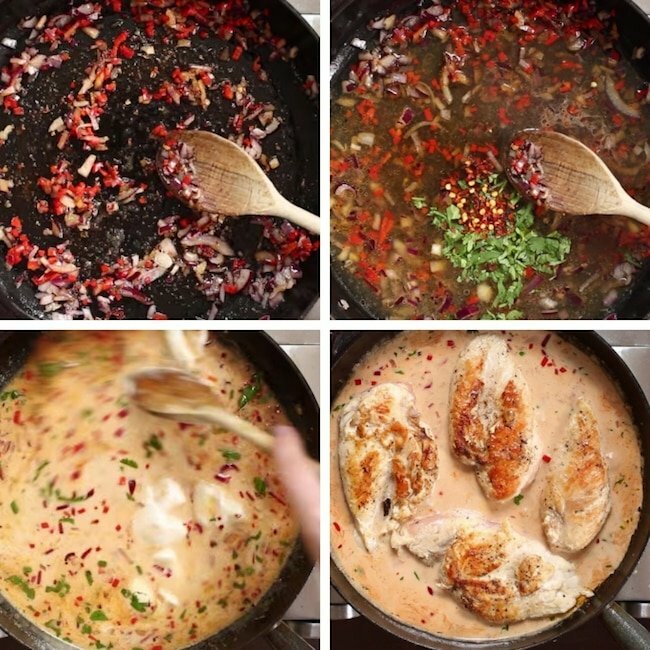 You’ll probably just want to thicken the sauce. Someone else left a comment a while back saying that they used almond milk instead and thickened the sauce with arrowroot starch and water and it still came out delicious. Hope that helps! I found this recipe and gave it a go. It was fantastic, although mine didn’t turn out near as pretty. It still tasted great. Where could I find the calorie amount of the meal? Thank you again for sharing this fantastic recipe! This recipe was AMAZING! I loved it! I do have one question though…..It says (4) chicken breasts. How much weight would that be about? Because I think I used way too much chicken…..I had two chicken breasts, about 2 1/2 lbs of chicken total? It seemed like there was way more chicken than I should have. So glad you liked it! I should have clarified the weight on the recipe! The chicken breasts that we’re usually able to buy weighs about 5-6 ounces per breast which comes out to around 1 1/2 pounds of chicken for 4 pieces. I’ll make that more clear in the recipe! This recipe was so delicious, my husband and I fought over the leftovers! We have a local Thai restaurant that makes a coconut soup that tastes just like the sauce. Next time we are going to triple the recipe and chop up the chicken to make it into a soup! I shared this on Facebook with my friends. Thanks for the recipe! Thanks for coming back to leave a comment! That’s awesome 🙂 Love the soup idea too! Wow! great, great, great ! My daughter wanted me to save some for her lunch the next day ; ) Great recipe! Thanks for sharing! So, I see the title is coconut lime chicken, but I’m wondering if the coconut flavor is prominent? 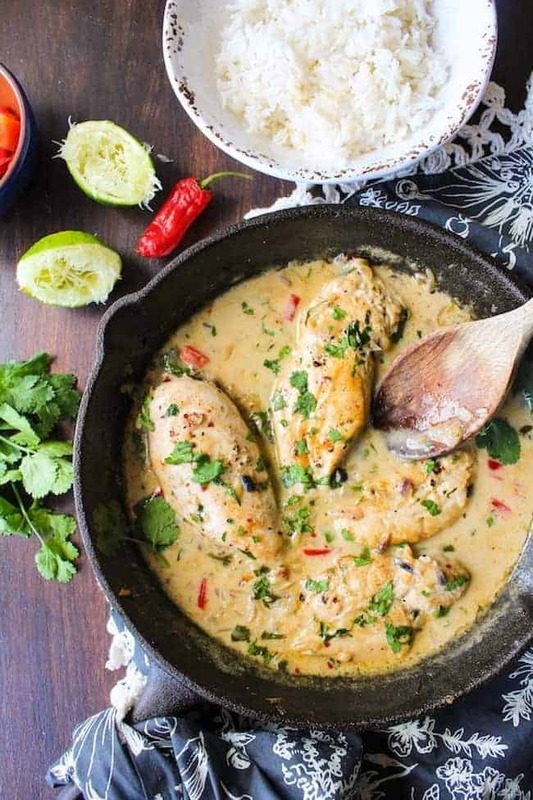 A silly question, maybe, but my husband HATES coconut, however, I’ve used the coconut milk in chicken curry before and he loved it. Just curious what you think. Thanks! Personally, I don’t think the coconut flavor is that strong. If he’s ok with coconut based curries in the past I *think* he might be alright with this one because a lot of the other flavors shine through. Hope that helps! Wow thia is now a staple in our house. It was so delish! Thanks Nina! So happy to hear it was hit 🙂 Thanks for coming back to leave a comment! Hello! I made this and it came out delicious, followed he recipe to a T! I want to make this again for a group of 10 though. How do you suggest going about that? I was thinking browning the chicken in batches and making the sauce in batches then throwing it all in a casserole to finish in the oven? Maybe? Not sure on time or temp though. My cast iron skillet isn’t the biggest, so I think finishing in the oven would be my best bet. Thoughts? Because I have a couple of large slow cookers, I think I would put the meat and sauce in the cooker and set it on warm. So another method to consider…Gonna make this soon! I need to try it in the slow cooker! I imagine the flavors would be even more prominent once it all has time to blend together. I hope you like it! You’ll just need to make sure you cook the chicken thighs longer, but that’s no problem! Hope you like it! We made this tonight and made a few substitutions. I used almond coconut milk instead of the coconut lol and loved the light flavor. So good! Thanks for a healthy GF and DF recipe. Good to know it’s still good with the almond milk! thanks for stopping by again to leave a comment – glad you liked it! Made this for dinner tonight and it was delicious! Will definitely make this again. Thank you! This recipe was delicious! I made a few adjustments simply because I did not have all the correct ingredients in my cupboard. I used almond milk instead of coconut milk, and to thicken it a bit more, I added additional yarrow root with water. Thickened up quite nicely, although I’m sure the whole fat coconut milk would have been better. I’ll make sure to have that handy next time. I also used black pepper and cayenne as in place of chili flakes. I also didn’t have breasts so I used boneless, skinless chicken thighs. Sauce was delicious! Thank you for the recipe, and we will definitely make it again soon! Awesome! Thanks for coming back to share what you adapted! I love seeing how other people make things and I’m sure it helps anyone else who needs to make changes here and there. I omitted the cornstarch and it worked fine for me. Also important to note, 1 lime is equivalent to about 2 tablespoons, or one ounce. 1 tablespoon was not enough for the limey flavour so I did the whole lime which was small at 2 tablespoons. Thanks Natalie! I’ll make a note of that in my recipe! No issues with thin sauce here! I used 2 tabelspoons water to 1 tablespoon corn starch and my sauce turned into a globby goo. Still tasted ok, but not very visually appealing. Thank you for the recipe. I have a lot of mouths to feed so I made it plenty of chicken tenders and added sliced baby Bella mushrooms to it as well (we love mushrooms). The end result was amazing thanks to your recipe. The sauce is so good I literally can drink it. The lime and coconut oil combo with cilantro is just out of this world. That’s so great to hear! Glad you guys enjoyed it as much as do! Thanks so much for this recipe! It’s pushed me out of my cooking comfort zone and turned out delicious. Had it with Cauli Rice!!! That’s so great! Glad you liked it! Just made this tonight for dinner and it was delicious! Thanks for the recipe. So glad you liked it! Thanks for coming back to leave a comment, Vanessa! Hi, Sarah how many calories this meal have? Just curious. If I open a can of coconut cream and don’t use it all how long will it last in the fridge before going bad? You can freeze coconut milk! Lasts for about 6 months in a standard freezer. Use the extra coconut milk instead of water to make your oatmeal in the morning ! I LOVE that idea! Thanks, Shelley! Delicious flavors! I thought the sauce was very thin, too, but it didn’t bother me. I used canned, full fat coconut milk. I would, however, change to adding the cilantro at the very last moment, otherwise it’s not vibrant and green like your pictures. I couldn’t taste the cooked cilantro, either. Next time I would add a little bit of thickener and wait to add the cilantro till the end. Thank you for the fabulous recipe! One last thing – I used the remaining coconut milk from the can as part of my liquid when making my rice, to make a coconut rice – yum! I love the idea of using the water from the can to make the rice! I’ll have to try that next time. I’ll make a note about the cilantro – I always add extra cilantro at the end of dishes because my husband really likes it, but I now realize that it might be misleading in the pictures. Thanks for coming back to leave a comment! I’m glad you enjoyed it! Hi Roxanne – sorry to hear it didn’t work out for you. What kind of coconut milk did you use? I’m wondering if I need to specify the type of coconut because whenever I make this I never have issues with it being too thin. I know canned coconut milk can be very different from brand to brand and I think that might be why some people have problems getting their sauce to thicken properly. I’m sorry again it didn’t work out for you – I hope it still tasted good! I add desiccated coconut to give the sauce texture. Wonderful recipe and great to see all the comments with helpful tips also. Ooh I really like that idea – I’m for sure adding desiccated coconut the next time I make this! Thanks Leisha! This was delicious! I didn’t have chicken breast so I used boneless, skinless chicken thighs and sliced them into large strips so they would cook faster. I also used a poblano pepper instead of a chile. I didn’t have a problem with the sauce being thin but I did use coconut cream instead of milk. So good, definitely making again. Glad you liked it! Thanks for coming back to leave a comment! What is cocunut cream? It can’t n the thick stuff tjst you use to make pi a coladas? Coconut cream is basically just super thick coconut milk. You can find it in cans of full fat coconut milk – it’s usually the thick stuff at the top when you open the can. You can also buy coconut cream on it’s own in a lot of mainstream grocery stores these days. Right?! Thank goodness for pinterest – it’s saved me so many times! This recipe looks amazing! Thanks for sharing. Since I found it under Whole30 on Pinterest I just wanted to add one thing. The Organic Chicken Stock: Make sure you make a note for people to read the label. I have, unfortunately, found that even organic chicken stock adds sugar :-/ which is not Whole30 approved (that was my disappointment when cleaning out my pantry). Like I said, saving this because it looks AMAZING!!!! Thanks Anna! Isn’t it crazy how many unsuspecting things have hidden sugars? I’ll make a note of that in the recipe! Just tried this tonight and we loved it! I used coconut cream instead of coconut milk to thicken the sauce and served it over cilantro lime cauliflower “rice”. Thanks for sharing this – excellent! I was thinking about trying this in the crockpot. Thoughts??? I made this for dinner last night. Since reading in the comments that the sauce was on the thin side, I decided to thicken it just a little with a bit of cornstarch (mixed 1 part cornstarch with 3 parts water then stirred it into the simmering sauce). DH was late coming home from work so this sat on the stove on low for an extra 20 minutes. I was worried that the chicken would be overcook and be dry but it was just the opposite. DH kept saying how moist it was and loved the flavours. Seriously, how could you go wrong with coconut and lime? These are two of my favourites. Thanks for sharing this easy and delicious recipe! That’s fantastic! I’m so happy you both liked it! Thanks for coming back to leave a comment – they make my day! Would it be okay to use coconut milk from a carton? It’s what I usually have on hand. Either way, this recipe looks great! Can’t wait to try it! Thanks Jessie! Cartoned coconut milk should be no problem. Hope you like it! My sauce did not thicken. But it was good regardless. Any tips on how to fix that? Hi Andrea! This sauce gets thicker as it reduces down, but it doesn’t necessarily get thick like a gravy type of sauce. If you do want it to get thicker in that way then you can mix 1 tablespoon corn starch (or arrowroot flour for a paleo version) with 1 tablespoon water. Mix together until there are no lumps. Bring the sauce to a gentle boil and add the water/starch mixture. After a minute or two your sauce should be noticeably thicker. Hope that helps! I just saw this recipe and couldn’t wait until dinner to try it! Best lunch ever! Thanks for sharing. My family is going to love this! This looks amazing! Can’t wait to try it. I’m a sucker for all things coconut! I’ve grown more fond of coconut over time – there’s just so much you can do with it! Hope you like it as much as we do! That’s not embarrassing! Mike’s the same way. He’d happily eat it any way – I just get bored eating the same things which I could probably blame on Pinterest/seeing so many great recipes everyday 😀 Thanks Bethany! What a delicious dinner and a great way to keep chicken exciting. And, I just bought some coconut milk at the grocery store yesterday. Score! Hello, when you say 1/2 coconut from a can, what do you mean? Is that coconut milk, extra virgin coconut oil, or something else? Ahh sorry about that! It’s coconut milk. Thanks for pointing that out to me – I’ll fix it now!